The 6 x 5 Palram Skylight Plastic Amber Shed is an attractive shed with a traditional design and the durability of polycarbonate panels. Ideal for the smaller garden or simply those households with less garden equipment to store, this is a neat storage solution for any garden. This plastic shed measures 6 x 5 in dimensions. 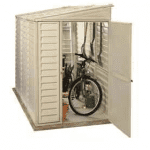 The shed benefits from a front vent, which keeps all of your belongings nice and clean. The shed is completely washable, and is maintenance free. There is a quick and easy access ramp for wheelbarrows and lawnmowers too. The skylight is made from polycarbonate and is UV resistant; this means your belongings and equipment inside the shed is kept safe. There is full water resistance throughout the building and the shed comes with a 10 year anti-rust guarantee. The double doors provide a wide enough entrance way for easy accessibility of your equipment. Although on the smaller side, compared with other plastic sheds, the Amber shed will fit all of those outdoor and garden essentials, keeping your garden neat and free of clutter. The 5 year manufacturer’s warranty gives you the peace of mind that this shed will be standing in your garden for many years to come. A plastic shed may not have one hundred percent of the charm and tradition of a wooden shed but they do their very best to combine a stylish exterior with a durable and long lasting storage solution. 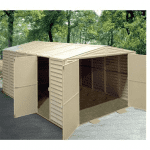 Their popularity continues to grow and they can offer many features that a wooden shed cannot. In this section we have a look at what the Skylight shed has to offer and how it can provide an effective storage solution for you. Exterior: The Palram shed has an attractive exterior in natural colours that will allow the shed to blend into the garden with ease. It is constructed with polycarbonate panels and a strong galvanised frame. It is water and weather resistant, as well as being completely maintenance free; ideal for those looking for an easy storage solution for their garden. Interior: The 6x5ft interior is on the small side but will provide enough storage space for those garden essentials or could alternatively be used as a bike storage shed. There is a floor ramp to allow easy access for wheeled items such as lawnmowers and bikes and the flooring is non-slip. An interior shelf is available as an optional extra and freestanding shelving could be used to create extra storage for smaller items. Doors: The double doors give an opening measuring 131cm, allowing easy access for the items stored inside. The doors are made from aluminium and provide strength and security for the shed. Security: For security purposes there is a latch on the double doors which may be locked with a padlock. A padlock may be purchased separately at a modest price. 6 x 5 Palram Skylight Plastic Amber Shed: How easy to build? The Skylight shed will arrive at your door in a flat-packed package containing all of the panels, roofing, fixtures and fittings required for a straight-forward assembly process. You will need to provide your own basic set of tools and although DIY experience is a plus, it is definitely not a requirement. Due to its smaller dimensions, the Amber shed could possibly be built by an individual, however for safety reasons and efficiency we recommend that two people work on assembly together. A comprehensive set of instructions will be provided and we expect that the shed could be built within an afternoon. 6 x 5 Palram Skylight Plastic Amber Shed: What is the overall quality like? 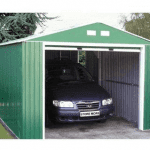 Palram design and manufacture a large range of garden sheds and greenhouses to meet a variety of requirements and to suit different garden’s needs. The 6x5ft Skylight Shed is an example of how a plastic shed can make a fantastic addition to your garden. Durable, weather resistant and maintenance free, the only thing this shed lacks is the charm of real timber construction, however even that issue is resolved with the attractive colouring and exterior. With two vents providing internal ventilation and the water and weather resistance of the polycarbonate panels, your equipment will be kept dry, secure and free from damp and mould. 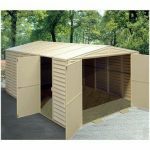 Overall this shed offers complete protection for your items year round, as well as being durable and long lasting. Complete with a 5 year manufacturer’s guarantee, you can be assured that this shed will be a long serving building within your garden. The 6 x 5 Palram Skylight Plastic Amber Shed is designed in traditional colours and styling but with the advantages of a plastic shed. 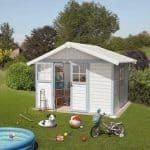 Maintenance free, this fantastic shed is durable, long lasting and would be fantastic for the smaller garden. At this very competitive price you couldn’t go far wrong with the Skylight Amber shed if you have a smaller number of items to store. If you have a large amount of equipment we would suggest looking at a larger shed. 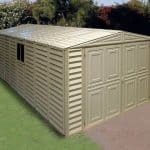 I am interested in buying a plastic shed 6×5 in amber or green .